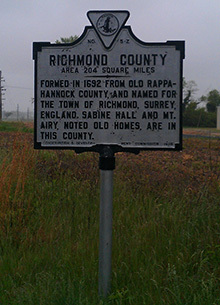 Richmond County, Virginia was formed in 1692 from old Rappahannock County. There is no consensus on the origin of Richmond County’s name, but it has been accepted that the county was named for the First Duke of Richmond, cousin to King William and Queen Mary. It is believed that Richmond County was inhabited by the first Indians, who migrated to hunt and gather food for their small, mobile families, more than 10,000 years ago during the Paleo-Indian period in 11,000 B.C. Artifacts from this time have been found around the county. 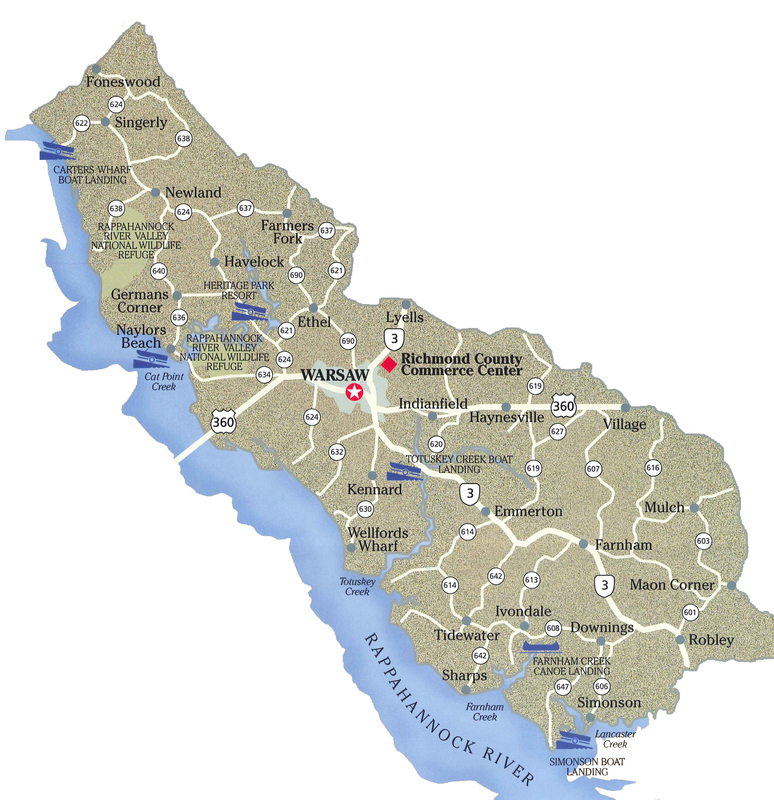 Richmond County is located in the heart of the Northern Neck of Virginia, where it lies on the north side of the Rappahannock River. Its 192 square miles of community is within one hour's drive of the city of Richmond, Virginia and within two hours' drive of Washington D.C. Throughout its existence, farming, fishing, and forestry have formed the backbone of the county's economy. Serving as the crossroads of U.S. Route 360 and State Route 3, the county seat of Warsaw is currently the headquarters for many regional government agencies as well as a regional community college, vocational center, and jail. To learn more about Richmond County, please click here to view our community profile.